"Billy Blue Hair and Me" Personalized DVD Series Puts Your Child Into the Video Adventure! 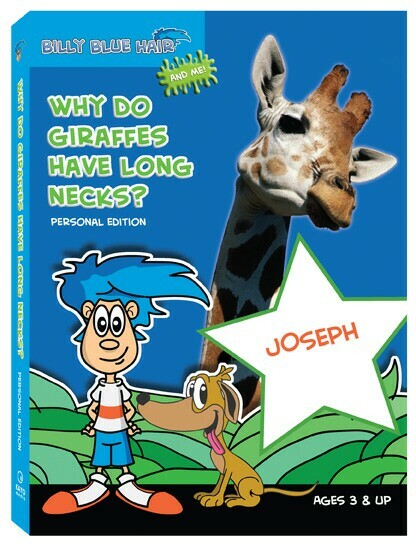 Personalized DVDs Make Learning Fun as Animated Characters in the Program Say Your Child's Name -- Initial Title in the Series "Why Do Giraffes Have Long Necks?" Available on DVD October 14, 2008 from Kayo Media. "Billy Blue Hair and Me" Personalized DVDs Make Your Child Part of the Adventure! Why do giraffes have long necks? Why do zebras have stripes? These are a few of the questions asked and answered in the delightful new Billy Blue Hair™ and Me personalized DVD series available online October 14, 2008, from Kayo Media. Billy, a hip quirky kid with blue hair, is the guide and educator as he and young viewers learn the answers to fascinating questions about animals and their environments in this live-action and animated DVD series. What makes Billy Blue Hair so unique is that Billy talks directly to the child watching the DVD using his or her name -- making the child part of the story -- all personalized thanks to mom or dad (or Grandma or Grandpa). "Keeping kids focused so they can learn is the prime goal behind 'Billy Blue Hair.' That's why we've created the 'Personalized Editions,'" says Kris Olson, founder and creator of the series. "Having little Joey or Alice hear his or her name from Billy Blue Hair will capture their imagination and create a fun learning environment. Billy is their personal teacher having a one-on-one conversation with that child at home. And with creative visuals, humorous outcomes and easy-to-follow story lines, we aim to educate kids on why things are the way they are." 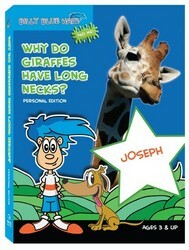 The initial title in the series, "Why Do Giraffes Have Long Necks?" has won the iParenting Media Award, the Telly Award and a KIDS FIRST! endorsement. The non-personalized version was also an Official Selection in the KIDS FIRST! Film and Video Festival. School Library Journal says "With great production values, a wealth of interesting facts, and a likeable guide, this first episode in the series is a must-have for every collection serving young children." Guide and educator Billy Blue Hair, along with his trusty dog Doogie, discovers fun and quirky facts about the world. Driven by adventurous and humorous storylines, Billy interacts with the viewers by asking questions and helping the viewers understand fascinating facts about each topic. Each 30-minute title in the series features Billy searching for Doogie, who is retrieving his ball, which leads into the live-action version of the show. In "Why Do Giraffes Have Long Necks? ", Billy takes kids on a journey throughout the world, introducing them to such animals as bison, apes, monkeys, giraffes, zebras and lions. Along the way, Billy answers intriguing questions about the wild, encouraging kids to use their imaginations and expand their own sense of adventure. Billy Blue Hair and Me features a special greeting by Billy and then Billy talks directly to the child by name throughout the program. The child's name also appears on the cover of the DVD package. Future episodes in the Billy Blue Hair and Me DVD series include "Why is the Grand Canyon So Big?" and "Why Are Fire Trucks Red?," to be released early 2009. Each Billy Blue Hair and Me DVD is available for a suggested retail price of $29.95 and is delivered directly to the child's home within 7-10 days. The series is recommended for ages three and older. Visit http://www.billybluehair.com to order and build the personalized DVD online. Kayo Media is the creation of Kris Olson who has more than 15 years of experience within the web design industry. Kris worked with the web design team for AtomFilms, a short-film distribution company that merged with Shockwave. After several years working on corporate videos for Internet distribution and creating his own web design company, iSeattle.com, Kris came up with the idea for Billy Blue Hair and created Kayo Media.